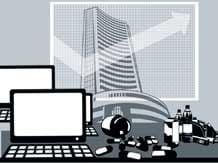 Benchmark indices are trading firm after trimming some of the early gains led by the surge in auto, select banks and capital goods stocks. At 12:54PM, 30-share Sensex was up 337 points at 27,465 and the 50-share Nifty was up 93 points at 8,253. According to a finance ministry report, the government expects key-interest rates to remain unchanged until end of March quarter while GDP growth rate for fiscal year 2015 is foreseen to be around 5.5%. In the broader market, both BSE midcap and smallcap indices are moving in-line with the front-liners with gains of 1% and 1.2% each. Market breadth in BSE is positive with 1,515 advances against 882 declines. Meanwhile, selling by foreign institutional investors continued and they were net sellers in Indian equities worth Rs 874.89 crore on Thursday, as per provisional stock exchange data. BSE Capital Goods and Metal indices, up 1.8% each are the lead gainers followed by BSE Auto, Power and IT indices. BSE FMCG and Realty indices are the only losers and are down by 0.2%. Bank shares have come off early morning highs and are trading mixed. ICICI Bank has gained close to 2%. According to media reports, the bank is in the process of sshrinking its international balance sheet by selling its subsidiary in Russia, repatriating capital from its UK (United Kingdom) and Canada arms. IT stocks have gained on firm first quarter results by Accenture. Infosys, TCS and Wipro have gained over 1% each. L&T has gained over 2%. The company has completed the definitive investment agreement with Canada Pension Plan Investment Board (CPPIB) for investment of Rs 2,000 crore in the engineering firm. Auto stocks have gained as the government prepares to get the Goods and Services Tax, Bill passed by the parliament. After receiving cabinet approval, the Goods and Services Tax (GST) Constitutional Amendment Bill is likely to be introduced in the Lok Sabha on Monday. Tata Motors has gained around 2.6%. According to media reports, Jaguar Land Rover,UK subsidiary of Tata Motors, is recalling 1,571 Jaguar XJ luxury sedans in the United States for a possible braking issue. Among pharma shares, Sun Pharma and cipla are under pressure while Dr Reddys Lab has gained close to 1%. The company has closed the acquisition of Habitrol Brand, an over-the-counter nicotine patch, from Novartis. Metal stocks are trading firm. Sesa Sterlite has gained around 2.5% while Tata Steel and Hindalco have gained around 1.6% each. Oil and gas shares are trading mixed. Reliance has gained around 2% and ONGC is up by 0.4%. GAIL has lost around 0.6%. The Supreme Court has given green signal to GAIL to take part in the tendering process for laying Ennore-Tuticorin pipeline.